Who doesn't love the taste of warm and chewy pizza? Turns out, it does have a place on a healthy plate. Here's how! Get the recipes for 2 crusts and 3 pizzas in "The SparkPeople Cookbook"
These healthful muffins freeze well. Make a batch on the weekend for a quick and tasty breakfast. Serve with fruit and milk. This is a great meal for a busy night--for some added fun, leave the forks in the cabinet and bring out the chopsticks! Cooking fish or chicken in parchment paper packets is a technique known as "en papillote." The protein stays moist without any added fat, and the herbs and fish lend flavor to the vegetables. This hearty salad provides a filling and fiber-rich base for classic roast chicken. Serve it alone as a vegetarian starter. Chef Meg took this member-submitted recipe and turned it into a hearty entree that's bursting with flavor. We've bumped up the nutrition--and kept all the flavor--of Pizza Margherita, the traditional Italian pizza with tomato, sliced mozzarella, basil, and olive oil. While Chicken Parmesan is traditionally fried, this lighter version is delightful atop a hearty green salad. From "The SparkPeople Cookbook: Love Your Food, Lose The Weight." Think we're crazy to include this recipe in a collection of healthy dishes? Truthfully, it illustrates our philosophy of satisfaction and eating what you love. We turned a quick-cooking side dish into a light meal by bulking it up with vegetables. Roasted chicken is a simple and versatile protein. Use it in soups, throw it on pasta or pair it with a simple salad. Tip: Save time and energy by roasting two chickens at once and freezing one (carve it first). This dish will turn anyone into a carrot lover! This dish uses whole and ground cumin to add a smoky, savory element to the carrots. Brunch will never be the same again! This rich and creamy dish is so delicious, you'll never guess we slashed the fat. This recipe is part of "The SparkPeople Cookbook"! Order your copy today! This is THE most popular recipe on SparkRecipes. 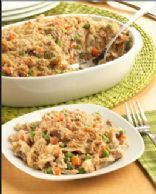 We've added more vegetables and reduced the sodium drastically to make it even better. A quiche is not only a quick brunch dish but also an easy dinner any time of year. Learn how to lighten yours up! Move strawberries from the dessert course to the salad course. Strawberries are delicious when combined with tender spinach and crunchy toasted almonds. This is really more of a process than a recipe. Rice paper wrappers, which are available in the ethnic sections of most larger supermarkets these days, are a great way to wrap your veggies and protein for a quick snack or light lunch. We cut the sodium on this hearty soup by swapping taco seasoning for three spices you already have on hand. There's a secret ingredient (garbanzo beans) that helps add fiber and thicken the dish. SparkPeople Cookbook Sneak Peek: Cheesy, rich, delicious--just what you expect in macaroni and cheese. What you won't expect? 2/3 the fat and half the calories of the original! 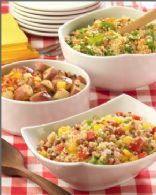 SparkPeople Cookbook Sneak Peek: A quick weekday meal that slims down and bulks up an old favorite. As a world master chef, you would think that Chef Meg's kitchen would be full of fancy tools. Nope. She prefers to keep it as streamlined as possible. She shares her 6 favorites with SparkRecipes.com. Fish is great for your health, but most of us don't know how to choose a fresh one. Learn how--and find out how to break down a fish and make fish stock. Watch how to properly slice and dice an onion, and get tips on doing it without shedding a single tear. Learn how to chop parsley the way the pros do. Learn how to chop and skin a mango easily and efficiently. Maneuvering around that giant pit can be tricky! Learn how to chop basil without bruising it, using a chiffonade technique. Want a quick and healthy meal any time of day? Turn to the omelet. Learn how to make an egg white omelet in this short video. Learn how to keep your spices and herbs organized. 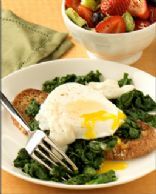 Learn how to poach an egg for a healthy, hearty breakfast. U.S. F.D.A. Safe Handling Instructions: To prevent illness from bacteria: keep eggs refrigerated, cook eggs until yolks are firm, and cook foods containing eggs thoroughly. A serving of protein is 2-4 ounces, but a chicken breast is much larger than that. Learn how to trim and prep this versatile lean protein, in this short video. Find out how to store, prep, and choose asparagus. You'll also learn how to save time in the kitchen, too! There's no need to spend more on pre-chopped veggies. Learn how to break down broccoli and cauliflower, and get a tip for using up the parts you might otherwise throw away. To keep chicken breasts from drying out (or serving them undercooked), you need to even out their thickness. Find out how! Swiss chard and kale are super greens, but what do you do with them? How do you remove the stalk--and can you eat that part? We'll tell you everything you need to know. Roasted garlic is a healthy and flavorful addition to any meal. Learn how to do it, with very little added oil or fat. How do you separate an egg without breaking the yolk or making a mess? Learn how--no fancy gadget needed! Uh-oh! You can't remember the last time you bought eggs, and omelets are on the menu for tonight. How do you know if your eggs are still good? Find out! "Mise en place" means to put things in their place in French. In this video, you'll learn a simple way to organize your ingredients for a healthy meal. Staying organized helps Chef Meg put a healthy dinner on the table on even the busiest of nights. Take a peek inside her fridge and learn some great tips! Ever wonder what Chef Meg keeps on hand for busy nights, quick dinners, and healthy snacks? Find out now! Learn how to roast a pepper, remove the skin, and use it in recipes. Learn how to segment or "supreme" citrus fruit for salads and desserts. Staying organized helps Chef Meg put a healthy dinner on the table on even the busiest of nights. Take a peek inside her freezer, and learn some great tips! Learn how to properly remove zest from citrus fruit with Chef Meg Galvin of SparkRecipes.com.